Global demand growth for fluorochemicals is forecast to accelerate, rising 3.8 percent per year to 3.8 million metric tons in 2018. China will continue to be the largest and one of the fastest growing markets, with only India experiencing more rapid growth. Fluoropolymers will be the fastest growing product segment. 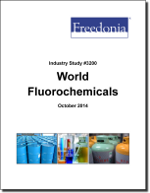 This study analyzes the 3.2 million metric ton world fluorochemical industry. It presents historical demand data for 2003, 2008 and 2013, and forecasts for 2018 and 2023 by product (e.g., inorganics and specialties, fluorocarbons, fluoropolymers), market (e.g., refrigerants, aluminum production, blowing agents), world region, and for 15 countries.